Enbridge’s current Line 3 route (blue) and Enbridge’s preferred route (red). Part I of a series looking at Ojibwe Band response to Administrative Law Judge Ann O’Reilly’s report and recommendations on the Enbridge Line 3 tar sands pipeline. The [Leech Lake] Band is different than the White Earth, Red Lake, Mille Lacs, and Fond du Lac Bands. The [Judge’s] Report fundamentally fails to understand this. The Band is again trying to make that clear so that the [Public Utilities] Commission will not miss the point, as well. Enbridge, a Canadian energy transportation company, has proposed a 1,000+ mile crude oil pipeline from Alberta to Superior Wisc., crossing northern Minnesota. 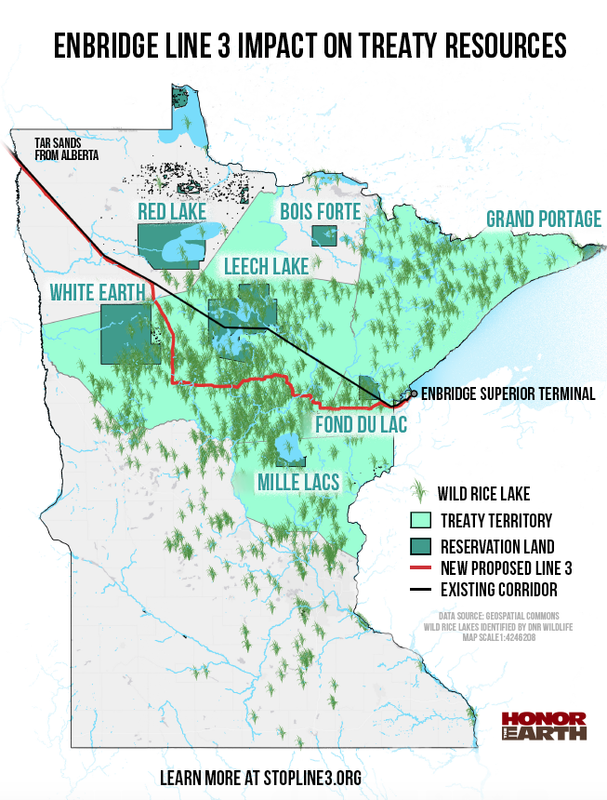 It wants to reroute Line 3 through part of Minnesota, opening a brand new pipeline corridor to avoid Leech Lake and Fond du Lac lands. 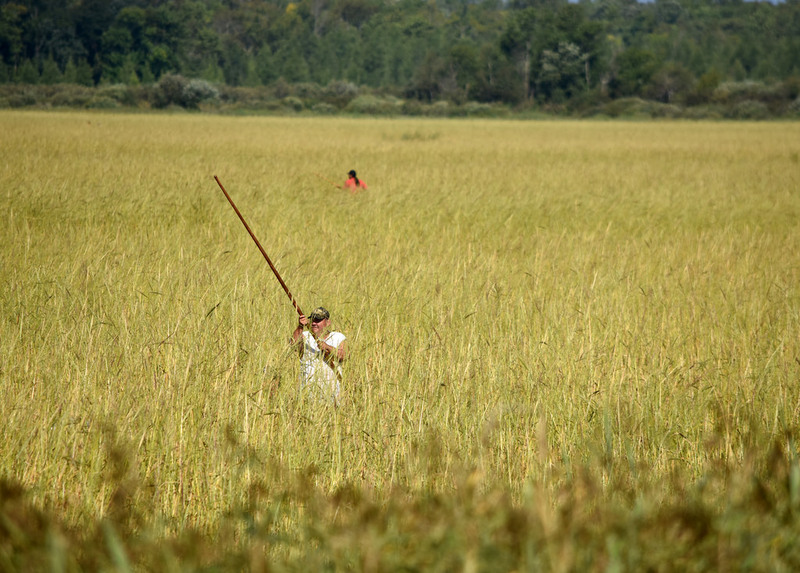 That route would still cross lands where various Ojibwe Bands have reserved “usufructuary” rights to hunt, fish and gather. O’Reilly’s recommendations say if a pipeline is to be built, the best option is to remove the current Line 3 and rebuild in the same trench. She argues that plan has the environmental benefits of removing the old, decaying pipeline, and avoiding the environmental damage of opening a new pipeline corridor. The plan also has the economic benefit of creating jobs to remove the old pipeline, a project estimated to cost $1.2 billion. The Band does not accept the Report’s assumption that the Project’s impacts on off-reservation natural resources would have a greater negative socioeconomic impact on the tribal community than in-trench replacement of the pipelines across reservation lands. The Minnesota Public Utilities Commission is expected to vote on Line 3 in late June. It will rely on O’Reilly’s report for its deliberations. O’Reilly’s report also fails to acknowledge the impact on the Chippewa National Forest of removing the old pipeline and installing a new one, the Band says. Leech Lake co-manages the Chippewa National Forest with the U.S. Forest Service. The current Line 3 affects 157 acres of that forest. The Band has a memorandum of understanding with the U.S. Forest Service that was signed “to recognize treaty rights of tribes to hunt, fish, and gather wild plants on national forest lands.” Thus, to the extent [O’Reilly] was concerned about impacts on treaty rights, the record is clear that [the in-trench replacement plan] would have real and concrete impacts. The [PUC] should not ignore these facts.